Photos by Kelly Fretwell (top), Jennifer Walker (left) and Mary Vasey (right). Note the somewhat butterfly-shaped dorsal markings. 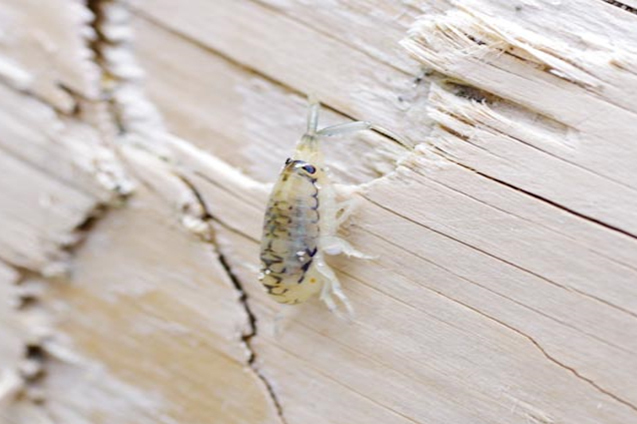 This small crustacean is pale grey with dark "butterfly" dorsal markings. It reaches 2 cm long, and like other amphipods its body is laterally compressed and elongated, making it look a bit like a miniature shrimp. Its antennae are similar in colour to the rest of its body. 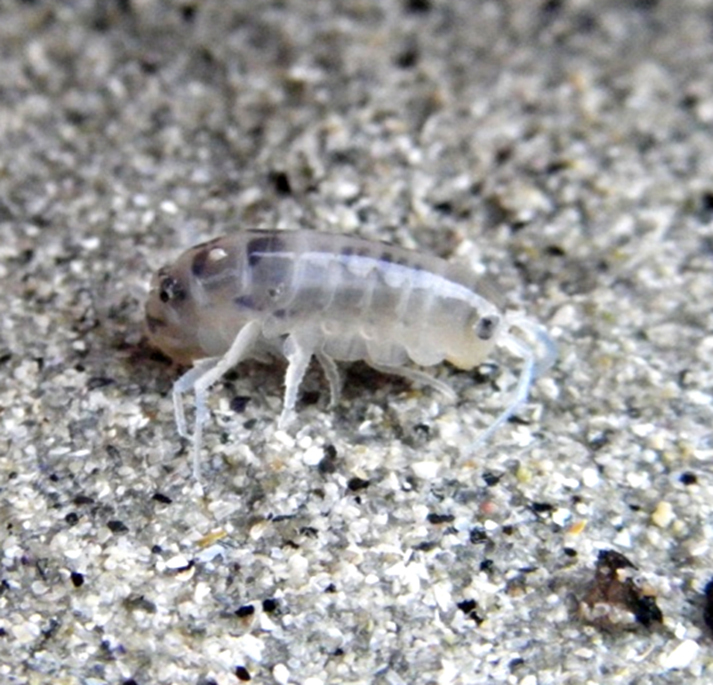 This amphipod can be found in large numbers in and around sea wrack (decaying seaweed and other washed up marine matter) in the high intertidal. 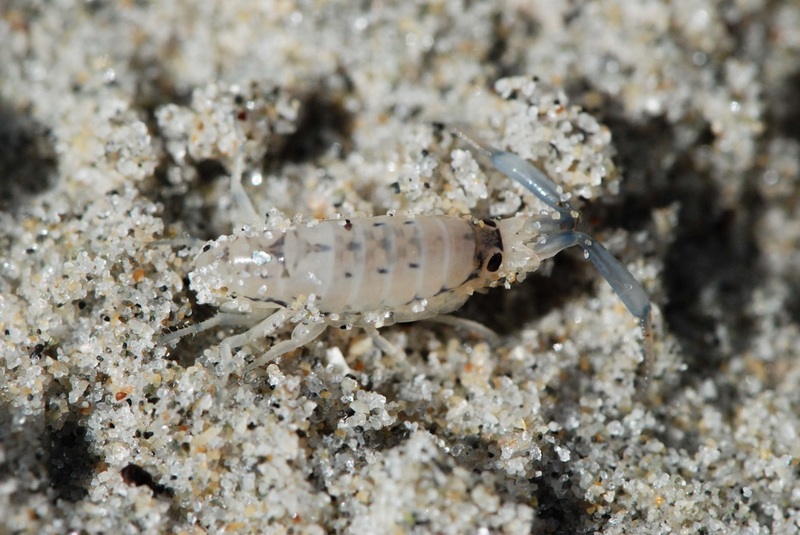 Like other amphipods, the pale beach hopper finds both food and shelter among wrack lines. Its range extends from southern Alaska to central California. Other common beach hoppers found in the Pacific Northwest are the bright pink Maera danae, Megalorchestia californiana (distinguished by its bright red antennae and larger size), and the darker grey or brown Traskorchestia traskiana. The pale beach hopper is most likely to be confused with the latter, but it can still usually be distinguished by its lighter colouring and its dorsal markings. ​Amphipods such as the pale beach hopper play a major role in breaking down algae and other detritus that washes ashore as marine wrack. Harbo, R. M. (1999). Whelks to whales: Coastal marine life of the Pacific Northwest. Madeira Park, BC: Harbour Publishing. P.